Pharmaxis consolidated its position as a significant competitor in the NASH market as the Company's LOXL2 inhibitor joined its SSAO inhibitor in the clinic late in 2017 and with the phase 1 studies demonstrating a best in class profile for two compounds. Extensive pre‐clinical showed the compounds displayed all the characteristics of a successful once a day, oral drug showing excellent efficacy in several different in vivo fibrosis models including fibrosis of the liver, lung, kidney and heart. In the fourth quarter of 2018 positive Phase 1 clinical trial results were reported on both compounds, confirming long lasting inhibition of the target LOXL2 enzyme. In January 2019 Pharmaxis announced that, following completion of 13 week toxicity studies, the program was ready to enter phase 2 clinical studies for diseases such as NASH, IPF and cardiac fibrosis. The Pharmaxis drug discovery group has developed a number of selective small molecule inhibitors to the LOXL2 enzyme utilising the same amine oxidase platform that delivered the anti-inflammatory drug that was acquired by Boehringer Ingelheim in 2015. The LOXL2 enzyme is fundamental to the fibrotic cascade that follows chronic inflammation in the liver disease NASH, cardiac fibrosis, kidney fibrosis, and idiopathic pulmonary fibrosis (IPF), and it also plays a role in some cancers. The extensive pre‐clinical program performed on the program compounds confirmed that they have all the characteristics of a successful once a day, oral drug showing excellent efficacy in several different in vivo fibrosis models including fibrosis of the liver, lung, kidney and heart. In regulatory toxicity studies, our compounds have been well tolerated and shown a good safety profile with long lasting inhibition of LOXL2 enzyme after a single oral dose. Watch a presentation on the LOXL2 program by Pharmaxis Head of Drug Discovery Dr Wolfgang Jarolimek (November 2018). In January 2018 Pharmaxis Ltd announced dosing of the first patient in Boehringer Ingelheim’s Phase 2a clinical trial in patients with diabetic retinopathy (DR), triggering a €10 million (~A$15 million) milestone payment to Pharmaxis. DR is the second disease to be targeted with the drug known as BI 1467335 which was discovered by Pharmaxis. BI 1467335 is also in an ongoing Phase 2a clinical trial for non-alcoholic steatohepatitis (NASH). Both studies are due to report in the first half of 2019. The Phase 2a clinical trial of in diabetic retinopathy will randomise 100 patients to either drug or placebo for a 12-week treatment period with an additional 12-week follow-up period. A subsequent Phase 2b study will seek to confirm and extend these findings. Diabetic retinopathy is the leading cause of vision-loss in adults aged 20-74. Of an estimated 285 million people with diabetes mellitus worldwide, approximately one third have signs of the disease. Boehringer Ingelheim’s two-pronged clinical program with BI 1467335 is focused on tackling the common diseases related to the complications of diabetes which affect millions of people worldwide. The drug was acquired by Boehringer Ingelheim in 2015 with an upfront payment of A$41m to initially study the chronic liver condition NASH. The milestone payment of $15 million for the commencement of a phase 2a trial in a second disease brings the total payments received by Pharmaxis from Boehringer to €57 million (~A$83 million). The total of all potential development milestones payable to Pharmaxis if both indications in the deal are approved is approximately A$625 million. Both development plans attract the same total development payments through to approval, with the 2nd indication milestone payments weighted more towards approval. The next milestones from BI are payable if they choose to commence phase 3 trials, at which time the two indications would attract a total of €62 million in milestones. Details of the DR clinical trial can be found here. Pictured above : Pharmaxis CEO Gary Phillips and Boehringer Ingelheim MD Australia & NZ Wes Cook mark the start of a new clinical trial in diabetic retinopathy. Pharmaxis has launched a Phase 1 clinical trial of a new compound targeting pancreatic cancer. 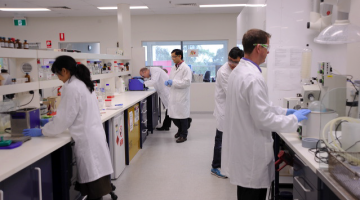 Dosing of the first subjects has begun, trialing an anti-fibrotic Lysyl Oxidase (LOX) inhibitor which has delivered positive results in pre-clinical testing. The compound is an oral once-a-day drug that inhibits all lysyl oxidase family members (LOX, LOXL1, 2, 3 & 4). It has shown significant reductions in fibrosis in in-vivo models of kidney fibrosis, lung fibrosis, myelofibrosis and pancreatic cancer. It is suited to the treatment of severe fibrosis as well as cancer with prominent stroma (connective tissue) or fibrotic metastatic niches. Pharmaxis hosted an investor research briefing in November 2018 featuring presentations by a Boehringer Ingelheim global project manager and a research leader from the Garvan Institute of Medical Research. The event provided an overview of the Pharmaxis drug discovery pipeline including the anti-inflammatory drug currently being developed by Boehringer Ingelheim, work in collaboration with the Garvan Institute of Medical Research on the anti-fibrotic LOX inhibitor targeting pancreatic cancer and the anti-fibrotic LOXL2 inhibitor program.